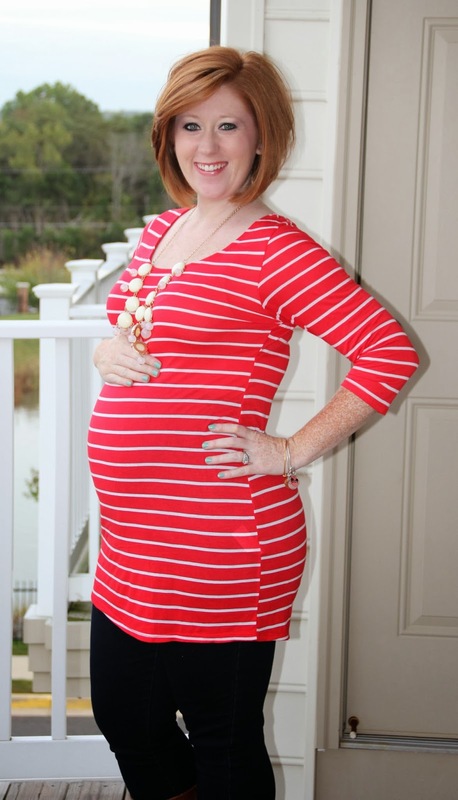 I am constantly on the lookout for great maternity clothes at an affordable price. I refuse to give up on fashion just because I'm pregnant (although some days it's really tough!). Is it just me or is maternity clothing super boring and plain? Don't get me wrong, I get it. The more basic the clothes are, the more versatile they are. But I've never dressed in just solids and I'm not about to start now! That's where PinkBlush Maternity comes in. They offer trendy maternity clothes at a price that won't break the bank. After all, aren't we supposed to be saving for things like diapers and formula? I certainly don't need to be spending all my hard earned money on a brand new wardrobe that I will only use for a few months! So, if I'm going to be forced to buy new clothes (It's the perfect excuse! ), I better not feel guilty about the price. When I was given the opportunity to review an item of my choice for PinkBlush Maternity, I jumped at the chance! I'm always looking for new pieces to add to my maternity wardrobe now that I'm getting bigger by the day AND that the seasons are changing. After much deliberation, I chose to go with this awesome red striped top for one important reason....the detail in the back! (you'll see if you keep reading). I love everything about this top. It's soft, lightweight and long enough to wear with leggings if you wanted to. But most importantly, it has a BOW!! Are you pregnant or know someone who is? You'll want to enter the giveaway below for your chance to win a $25 gift card to PinkBlush Maternity! The only rule is you can't win if you've won or hosted a giveaway in the past 6 months. that is an adorable top! I remember it being quite challenging to dress well and feel pretty when I was pregnant.